Associate Artist Lisa Ramirez’s revolutionary take on Maxim Gorky’s seminal 1901 play, The Lower Depths, reminds us that homelessness, poverty, inequality and moral corruption are not exclusive to contemporary society. In Gorky’s tremendously dark 1902 play, overlooked villagers in 20th-century Russia battle between truth and lies as heroically and tragically as did warriors and overlords in their day. 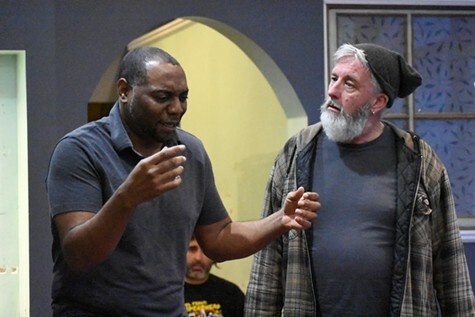 In Down Here Below, directed by Associate Artist Michael French, Ramirez frames the residents in a modern-day homeless encampment dubbed the Village of Radical Acceptance. Similarly, inhabitants of the impoverished and marginalized community, seek safety and sustenance — or simply to hang onto hope as counter forces sweep through at gale wind speeds. What is essential for survival? In part, art and artists asking us to consider exactly that question.